"in the living room" Here are some paintings that I've done recently. I helped ToeKnee Stanger do some of the mural painting at the AHA! Center, and he gave me some tips on how to work with paint. These are my efforts to practice what he showed me. 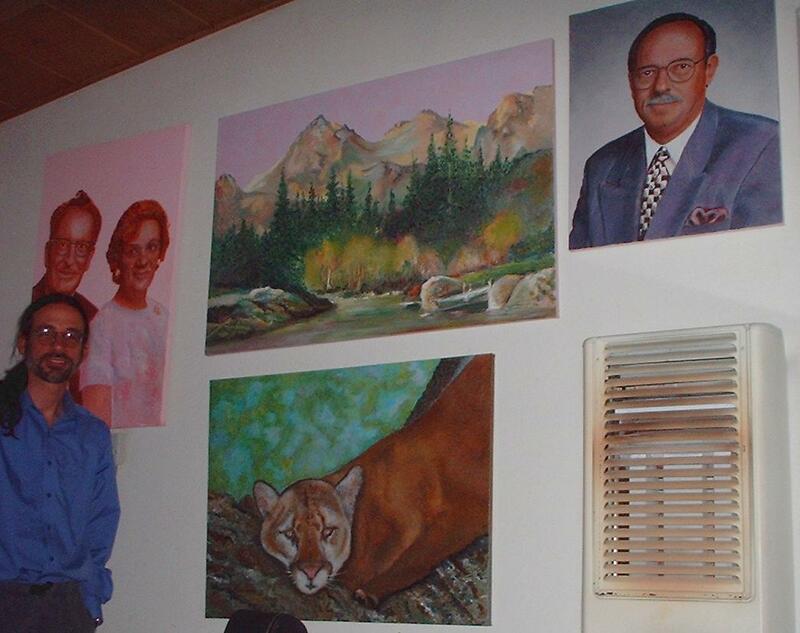 The paintings are presented in chronological order. Click on the thumbnail for a bigger version. "Clearing" An exercise in layering. 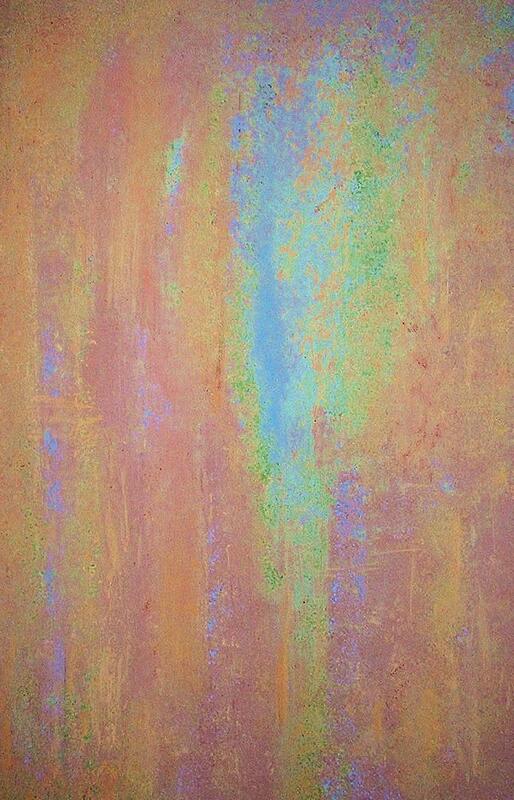 canvas 28"x42". Latex House paint + Acrylic highlights. Sponge, roller, brush. March, 2004. "Noah's Ark" A pot of 12 different succulent plants given to me by my next door neighbor, Mr. Shipley, when I was five years old. 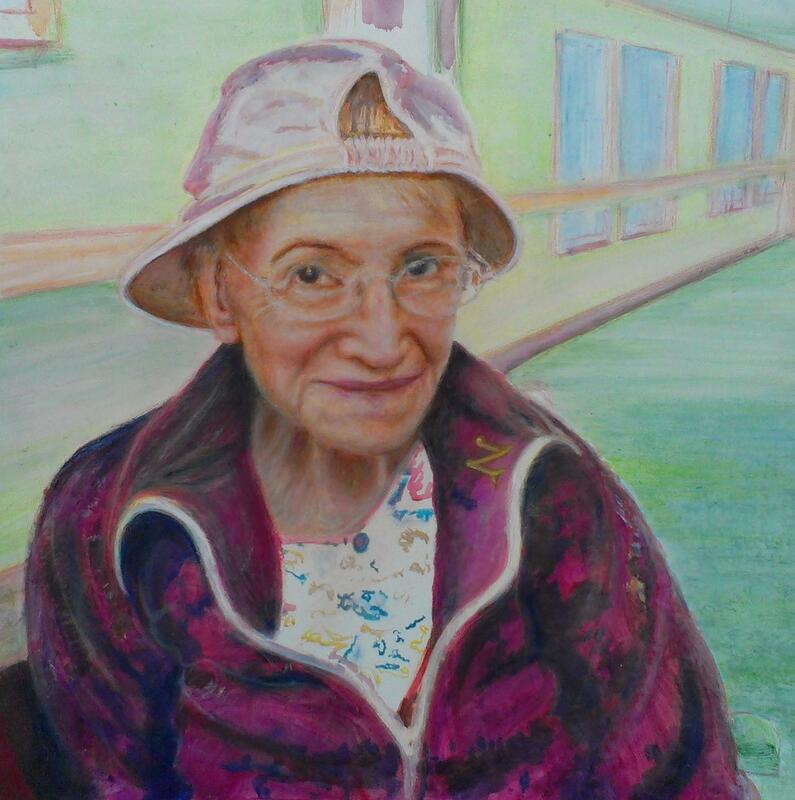 This painting had some finishing touches from Alicia Lind during a shared painting session. Acrylic on canvas, 24"x36". 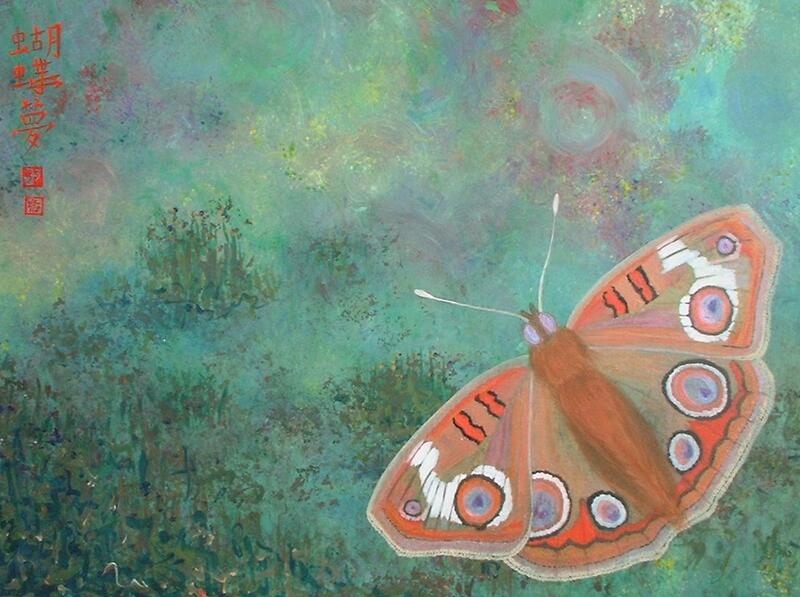 "TaiChi Dream" A butterfly I first saw at Joe Deisher's Tai Chi camp in Mendocino, CA. 34"x25.5" acrylic on canvas. 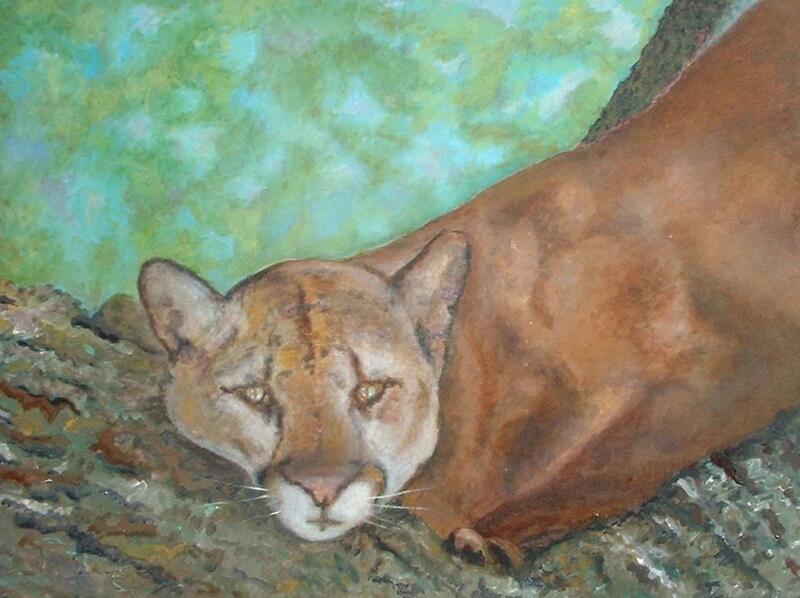 "Lion of Judah" This is a painting done from a newspaper photo of a mountain lion that strayed into residential Palo Alto. He was shot by a police officer seconds after the photo was taken. 34"x25.5" acrylic/oil on canvas. 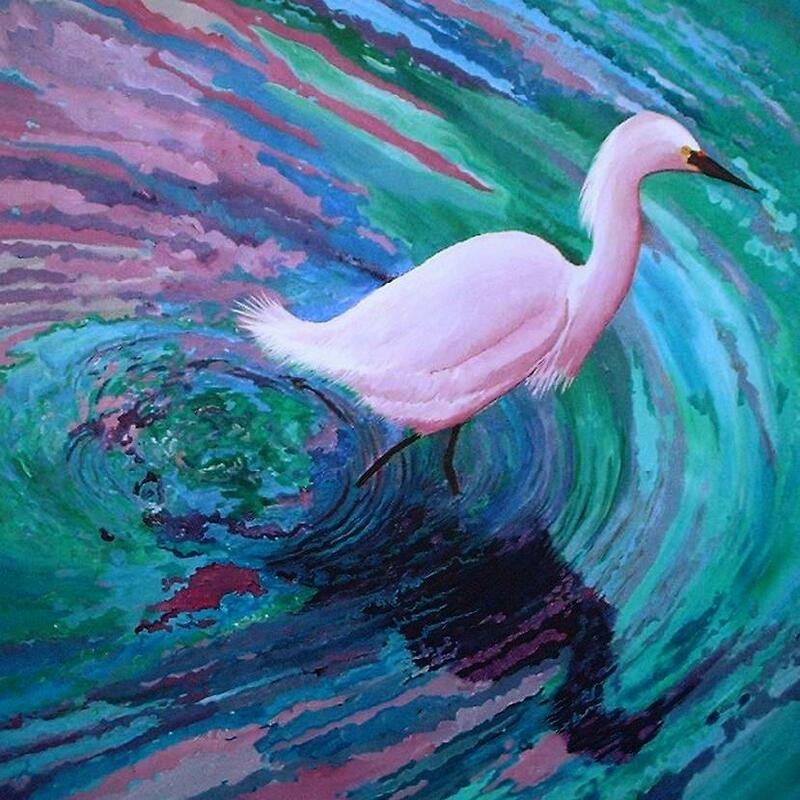 "Bolsa Chica Egret" 4'x4' acrylic on stretched canvas. From a photo taken by my sister Wendy, an avid birder. 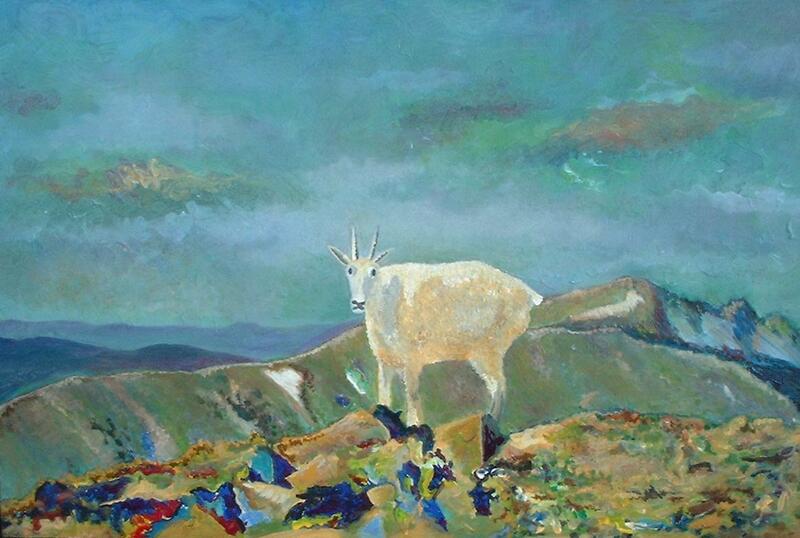 "Goat on Bald Mountain"
From a picture by my sister, Kristen, taken in near Yellowstone National Park. This picture reminds me of a gruelling climb that our family made to the top of Mt. Baldy in southern California. 18"x27" acrylic on canvas. 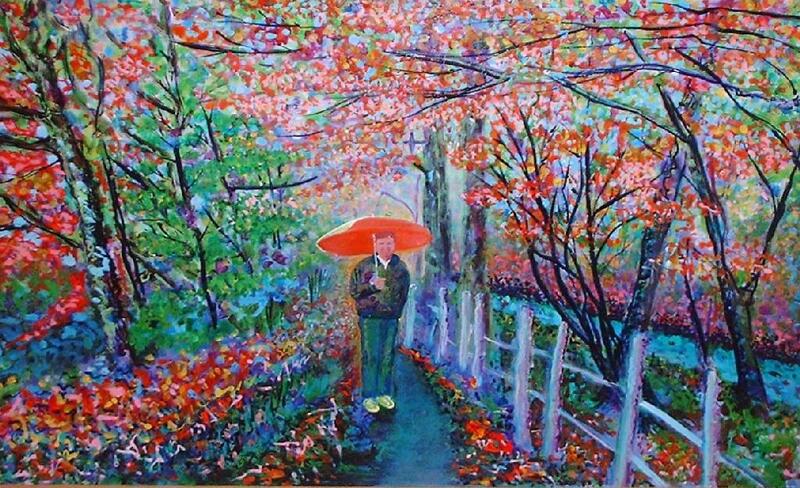 From a photo of Sherry's brother taken in a garden in Japan. Sherry is the caretaker of the AHA! center's garden. Finished early January, 2005. 18"x27" acrylic on canvas. "Balance" Acrylic on canvas, 24"x36". 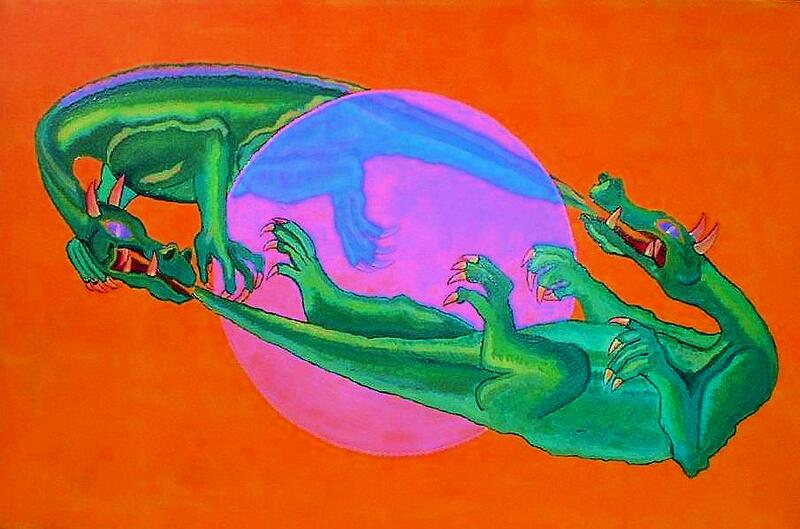 Inspired by the pen and ink drawing on the last inner page of the Whole Earth Catalog, "Dragon Steamboat" (1971) by Gurney Norman. During the time this painting was being worked on, some comments I received were: "they are just playing with each other", "those daemons", "two dragons", "fiercely struggling in a battle of life and death", etc. It is fun to see how a simple symbol can be interpreted all the way from "kid's playing" (do adults ever play?) to "death struggle". Finished middle January, 2005. "Selvakumar" Acrylic on canvas, 18"x27". Standing there is mama Sangeeta, and those are her three boys. The one seated is Dinakaran. 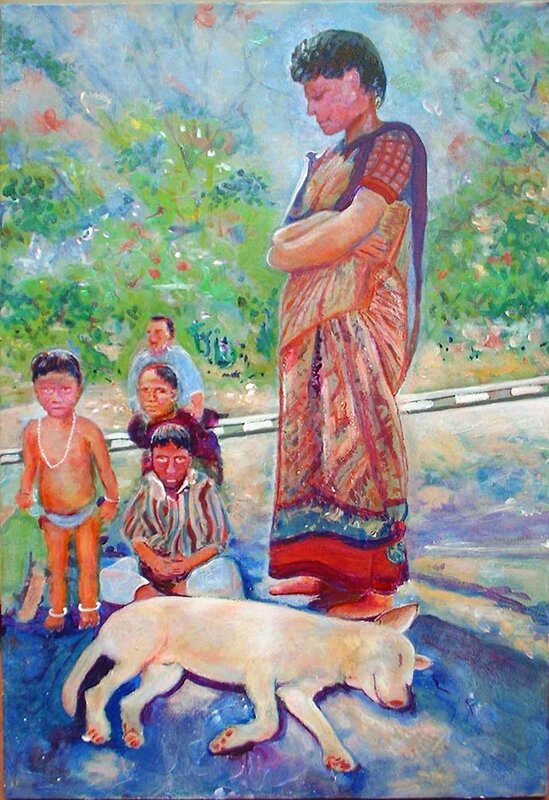 When the tsunami hit, Sangeeta tragically realized that she could only carry two of her boys. She picked up the two youngest and left seven-year-old Dinakaran, hoping he could run fast enough. She made it to safety, but was grief-stricken because Dinakaran had misunderstood and ran in the wrong direction - to the family's beachfront cabin. The dog, named Selvakumar, chased after the boy, pulled him out of the hut by his collar, and nudged and nipped him to safety. Good dog! Sangeeta's brother-in-law gave her the puppy, following the birth of her second son. When the brother-in-law died in an accident two years ago, they changed the dog's name to his. "Selva" means "riches" or "money". "Kumar" means "boy". Together, you get something like: "person-of-wealth" - a common name in South India. The painting is from a news photo, and is still not quite finished here. February 11, 2005. "Sisters at Hart Canyon" My two sisters, Wendy left and Kris right. 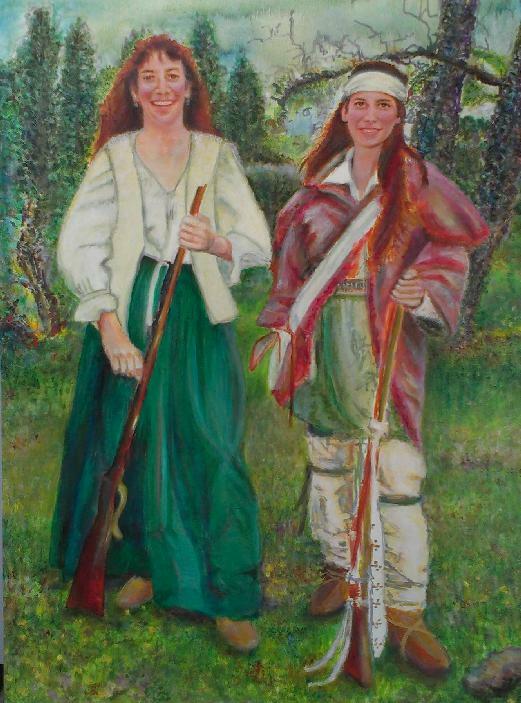 Dressed for a Rendezvous in Hart Canyon with muzzle loading rifles amidst oaks and pines. 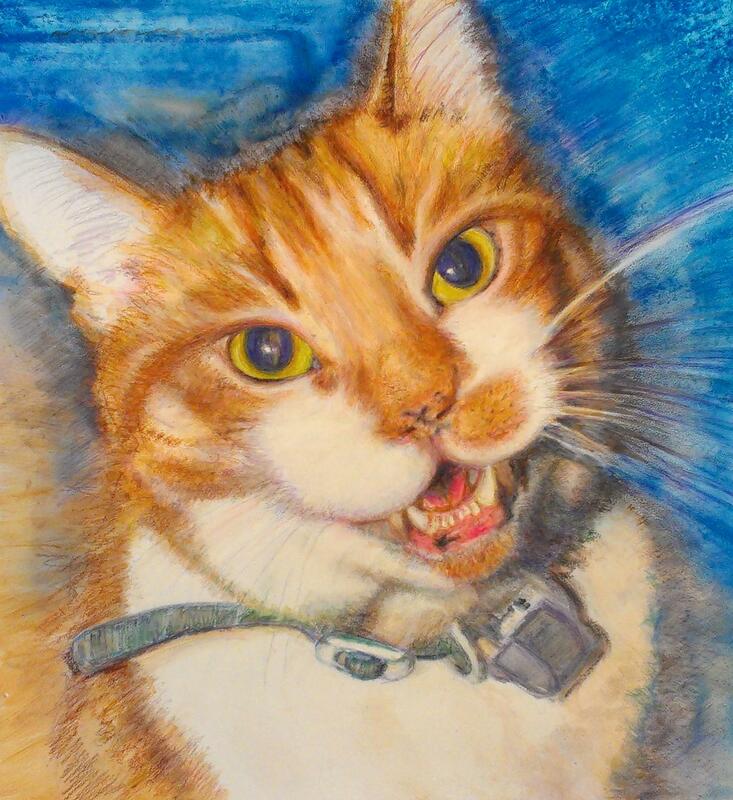 Probably two more overpainting sessions before I'll be happy with the expressions. Acrylic underpainting with waterbased oils, 24"x36" stretched canvas. August 16, 2006. "Abstract" This started out as a painting of bamboo shadows and then turned into an attempt to increase constrast and saturation while still keeping the shapes and patterns "interesting". It was painted, and can be displayed, in all 4 orientations. I see lots of interesting shapes: horses, humans, crabs, bunnies, birds, and so on. It proves that the unconcious is constantly expressing itself whether we are conciously controlling it or not. Stretched canvas. "Milo" My cat Milo. He would sit and listen to guitar lessons when Michele Duva would visit. Michele wrote a book about him titled "Waiting for Dawn" and this image became the cover. Stanford developed the grassy field next to my house, driving out all the native rodents. Their attempt to control the situation led to Milo eating a poisoned blue-jay. He died three days later from kidney failure. This is his memorial picture. 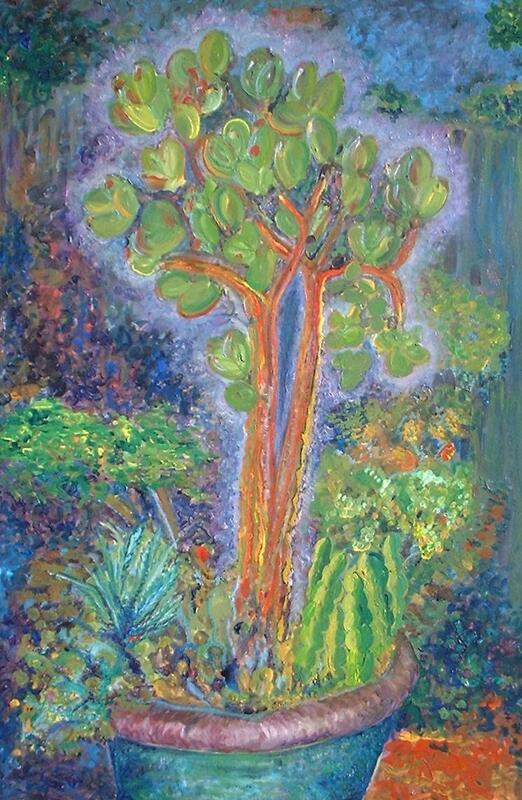 Multimedia on 2'x2' masonite panel. 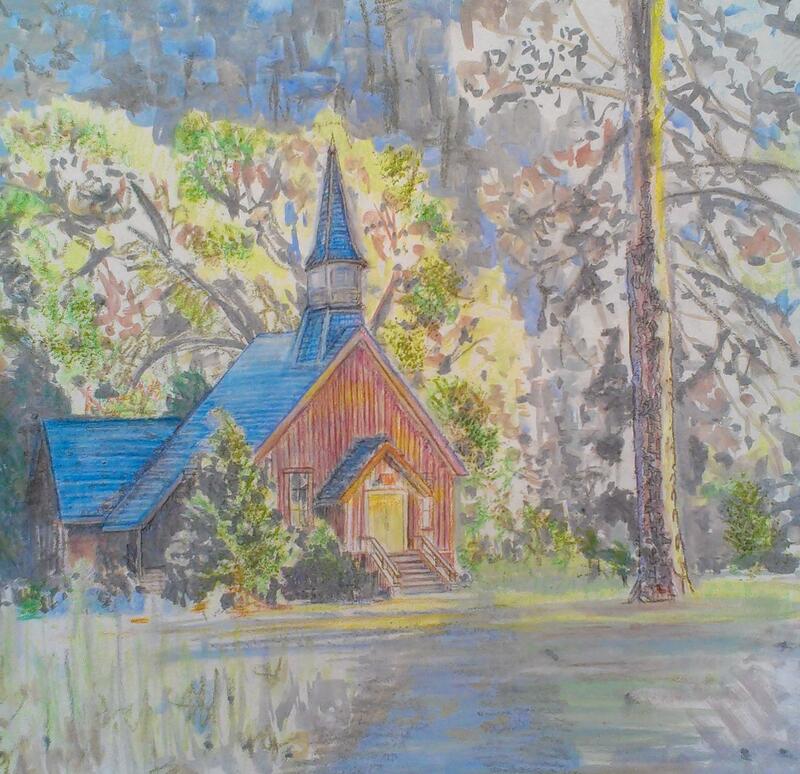 "Yosemite Church" Just a sketch of the Church in Yosemite valley. Maybe I'll paint some more on it later. Multimedia on 2'x2' masonite panel. 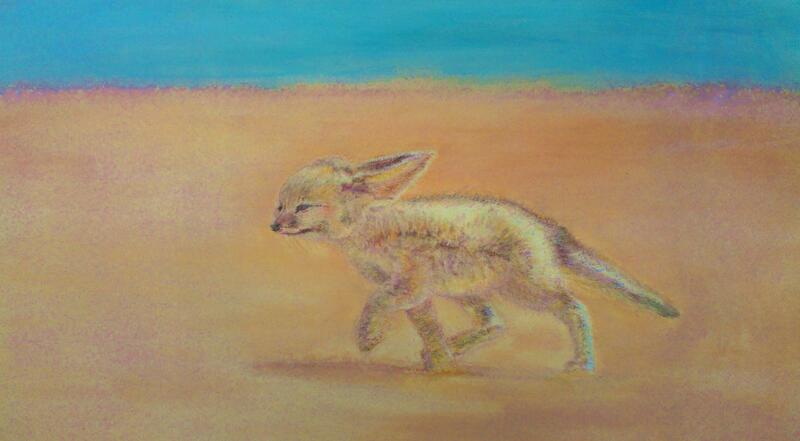 "Desert Fox" A desert fox. Looks pretty happy. Originally was 2'x2' masonite panel, but Chia-Lin said he looked "cramped". I then extended the composition on both sides with wooden framing, more masonite, spackling and lots of blending. Now he has room to run. Still a sketch. Maybe I'll paint some more later. "a pair of Taichi Masters" Joe Deisher and Jane Yao. 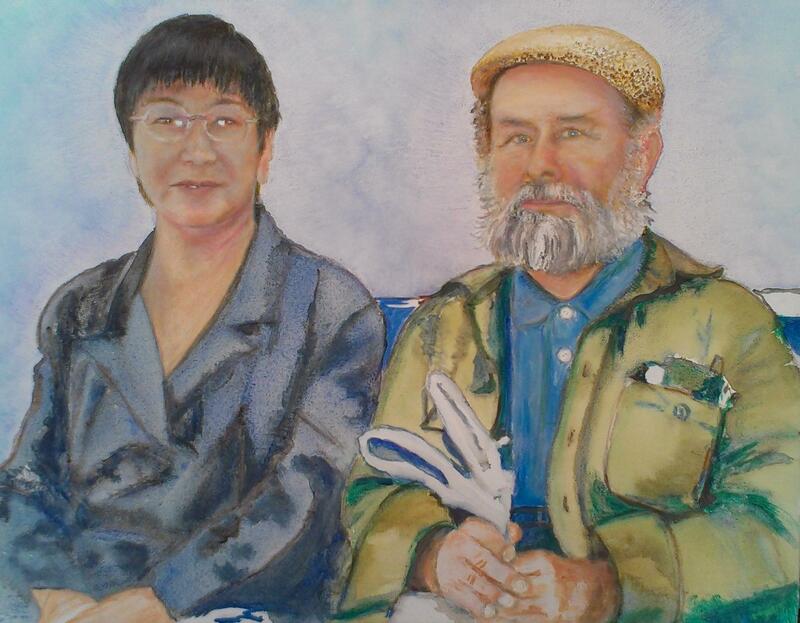 This was from a photo of them sitting at San Francisco airport just prior to me leaving with Jane for the November 2007 World Cup TaiChi competition. Multimedia on Stretched 22"x28" Canvas. "Zelda" My dear Aunt Zelda from a photo taken a few months before she passed. She's in a wheelchair at the nursing home. My cousin David has put a hat on her to protect her from the sun. To me, she has the expression of a buddha. Making the best of life and enjoying the visit with family and friends. Just looking in her eyes, I can remember all the happy times we shared together as I was growing up. 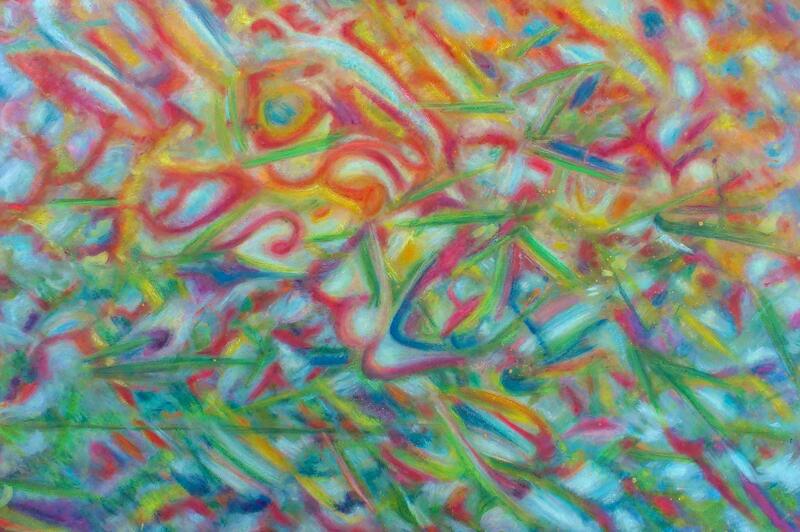 Multimedia on 2'x2' masonite panel.